'Metonymy' is a type of figurative language used in everyday conversation, a form of shorthand that allows us to use our shared knowledge to communicate with fewer words than we would otherwise need. 'I'll pencil you in' and 'let me give you a hand' are both examples of metonymic language. Metonymy serves a wide range of communicative functions, such as textual cohesion, humour, irony, euphemism and hyperbole - all of which play a key role in the development of language and discourse communities. 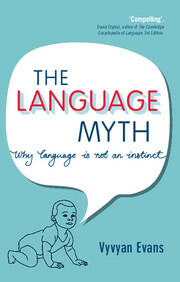 Using authentic data throughout, this book shows how metonymy operates, not just in language, but also in gesture, sign language, art, music, film and advertising. It explores the role of metonymy in cross-cultural communication, along with the challenges it presents to language learners and translators. Ideal for researchers and students in linguistics and literature, as well as teachers and general readers interested in the art of communication. "Jeannette Littlemore's book exposes the role of metonymy in all fields of life, from everyday language to the arts. A comprehensive, insightful, and engaging treatment of a fundamental cognitive mechanism." 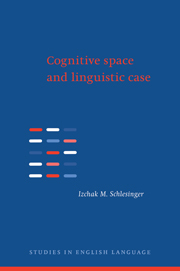 "From a cognitive-linguistic perspective, this book explores multiple theoretical and applied aspects of metonymy. With a clear and lucid style, Littlemore offers her readers a firmly integrated landscape that masterfully balances breadth of scope and analytical detail." "For a long time metonymy has remained the neglected sibling of metaphor, but Jeannette Littlemore now elegantly shows what we have missed. This book offers an encompassing and lucid overview of what contemporary researchers need to take into account when they address metonymy as an essential tool in language, thought, and communication. It strikes a dearly needed balance between theory, data, and relations to metonymy use in the real world and it may justly act as a programmatic frame for future research." 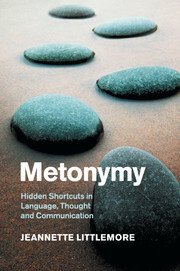 "Jeannette Littlemore's monograph shows conclusively that metonymy is a cognitively grounded phenomenon that is as pervasive, and probably even more fundamental, than conceptual metaphor in shaping language structure and use. 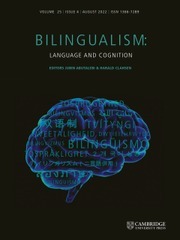 The author provides an impressive state-of-the-art overview of current research, unsurpassed in its breadth and analytic depth … A most welcome feature of the book is that the author demonstrates the significance and the workings of metonymy in sign language, literature, the arts, film, music, advertising, intercultural communication, and language learning. 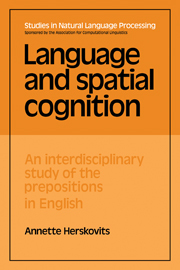 Moving beyond a purely conceptual analysis, Littlemore also critically assesses the pragmatic and socio-cognitive effects of metonymy, demonstrating its sometimes dehumanizing effects. 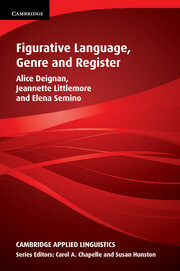 For years to come, this engagingly written and reader-friendly book will be a source of reference and inspiration for students and scholars alike and will boost innovative research on figurative language and thought." 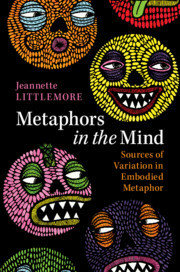 "Jeannette Littlemore's new book beautifully explains the complex workings of metonymy, how it differs from, yet interacts with, metaphor, how people acquire the facility to use metonymy, understand it, and employ it in diverse social and cultural situations. No single volume has ever provided this amazing breadth of material on metonymy, which is why this book will be an instant classic within figurative language scholarship." "Until recently, metonymy studies had to be content with playing second fiddle to metaphor analysis, both in terms of theoretical status and methodological applications. 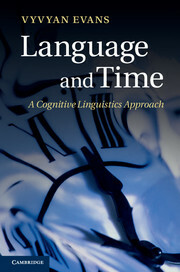 Littlemore's brilliant book puts paid to this tradition by giving a succinct overview over the advances in cognitive modelling of metonymy production, identification, comprehension and usage, as well providing fascinating insights into the interplay of metaphor and metonymy in real-world contexts, including political, therapeutic, pedagogic and intercultural communication." 1. 'What those boys need is a good handbagging'. What is metonymy? 4. ''BBC', her mother would have said'. What do people use metonymy for? 6. 'The Government of Britain is sort of there'. How can we identify 'metonymy'? 7. 'I found Robbie Williams in the lounge'. How is metonymy processed in the mind? 9. 'These huts did absolutely unbelievable work'. What do we now know about metonymy? 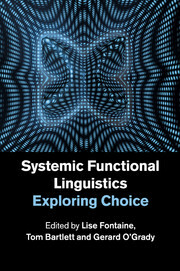 Jeannette Littlemore is a Reader in Applied Linguistics and Head of the Department of English Language and Applied Linguistics at the University of Birmingham.